Elite Cuisine Egg Cooker Review: The Elite EGC-007 is an egg cooker that comes from Elite a well known brand that has a number of other popular kitchen appliances under its belt including the Elite Platinum Pressure Cooker. 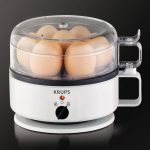 The EGC-007 allows a user to cook a maximum of 7 boiled eggs during a cooking cycle. The Elite Cuisine Egg cooker is a versatile unit not only allowing you to cook boiled eggs but also allows you to cook poached eggs and omelets. When we reviewed the Elite EGC-007 Cooker it was on sale for $12.59, however the list price then was $24.99 so the unit was heavily discounted. The price may have changed since we reviewed the Elite cooker. CLICK HERE to see the Latest Price. 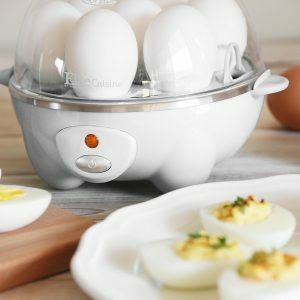 The Elite egg cooker weighs in at just 1.25 lbs which makes it easy to move around on a kitchen worktop when you need the space for something else. And its easy to pick up and move onto shelf in a cupboard. The unit is also very compact measuring in at 7 x 5.5 x 6.75 inches, which ensures it does not take up valuable retail space in the kitchen. The unit is available in a number of colors that will help you to make it fit into your kitchen ‘s style, color options include; red, teal, black, green, white and stainless steel. When you open the box you will find the base, a clear lid, omelet tray, egg poacher tray, measuring cup and egg tray. The egg tray will allow you to cook a maximum of 7 boiled eggs. The measuring cup comes with a series of measures on it that allows you to accurately measure the amount of water need to cook the eggs to your desired consistency. The poached egg tray is split in half allowing you to cook a maximum of 2 poached eggs at any time. The unit comes with a large sized omelet tray that will allow you to cook up to 3 full sized eggs with whatever toppings you enjoy. The lid is clear so its easy for you to see the eggs being cooked, and for some people its the most enjoyable part of the process. On the front of the cooker you will find a centrally located automatic shut-off indicator light that will light up during a cooking cycle and will let a user check to see when the cooking cycle is finished. The Elite cooker can cook a variety of different egg dishes from boiled to poached. Before you start cooking check that you have all the parts you need and ensure that cooker is sitting on a clean and dry surface. Before you fill the base remove the clear lid and any of the trays that are sitting in the cooker. You will get three different trays with this unit; poacher egg tray, omelet tray and egg tray. 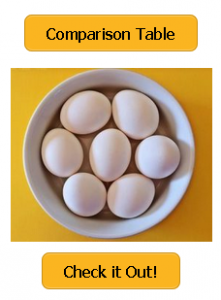 Based on the type of egg you want to prepare you will use the measuring cup to measure the correct amount of water. This is easy to do using the measuring lines on the side of the cup. The amount of water you use is determined by the amount of eggs you are going to cook. In terms of the water you use, in the manual it recommends using distilled water since tap water will contain minerals that may be deposited onto the surface of the heating plate. If you don’t have distilled water on hand then you may need to use white vinegar to remove any of these mineral deposits after a cooking cycle. Pour the measured water onto the heating plate. If you cooking boiled eggs then place the egg tray over the unit’s base. You will then need to place the desired number of eggs onto the egg tray. before dong so rinse the eggs and use the piercing pin on the underside of the measuring cup to make a small hole on the top side of the egg. Ensure the side of the egg with the hole is placed facing upwards. Place the lid onto the base and then press the power button on the front of the base. Once the water has evaporated the unit will power off and the indicator will turn off. As soon as this happens remove the eggs from the base using the egg tray and rinse under cold water to prevent over cooking. When cooking poached eggs or omelets you would place the respective trays on top the egg tray during a cooking cycle. If your fed up of having to boil water and set timers then the Elite EGC-007 could be the appliance for you. You might get fed up with how easy it is to use. All you need to do is pour the correct amount of water into the unit, turn it on and forget it unit the eggs are ready to be removed. If your worried about counter-top space don’t be the Elite EGC-007 is compact measuring in at 7 x 5.5 x 6.75 inches, so will take very little room on your precious work top. 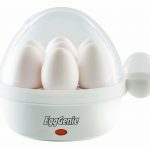 With it being capable of preparing a variety of egg dishes from boiled eggs, poached eggs and omelets it will help to replace a number of other appliances helping to save valuable cupboard space, prep time and money. 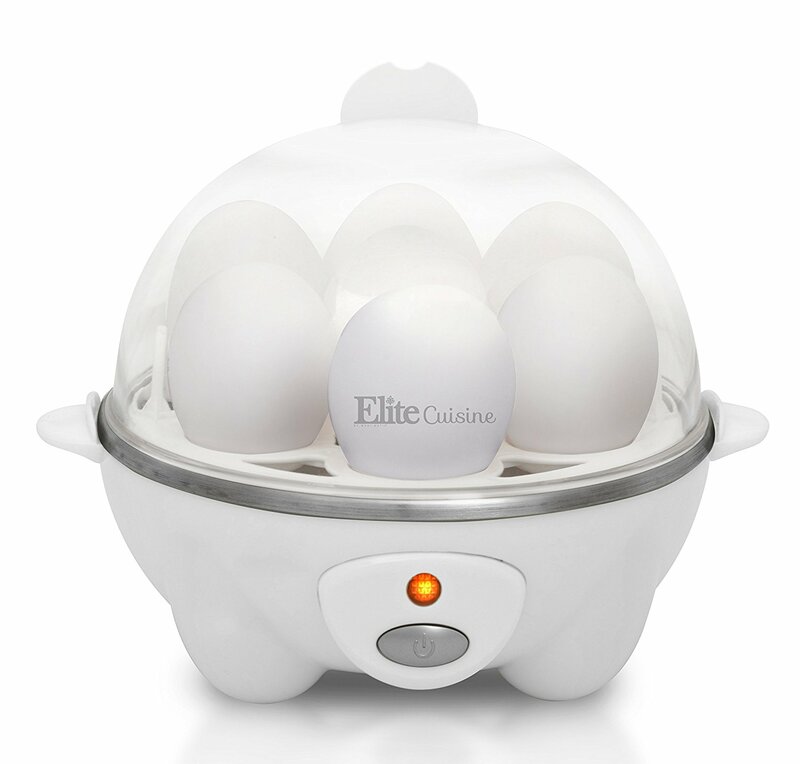 The Elite Cuisine Egg Cooker will be one most useful kitchen gadgets you could own. It is compact and versatile preparing easy to peel boiled eggs. And with a maximum capacity of 7 boiled eggs it would easily cook for a small to large family. What do users say? 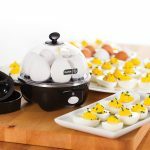 When looking around the Elite Egg Cooker scores well with users; at the time of writing this review it has over 2000 customer reviews on Amazon with a rating of 4.3 out of 5.0. See the latest user rating at Amazon. 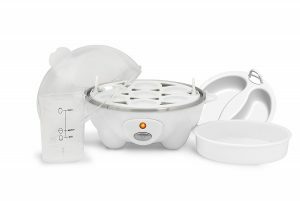 Another popular and high recommended model is the Dash Go Rapid Egg Cooker. 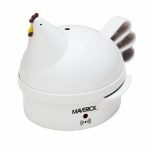 It is capable of cooking up to 6 boiled eggs at any time. Find out more by reading our Dash Go Rapid Egg Cooker Review.